Ihey were suddenly told that their visas had been cancelled. piion in the Middle East. Marilyn Lam pert, Robert E.
p.m., at the home of Mrs.
mission or situation in Beirut. campaign is $5,000 or more. tame in and she was spared. lived to be over 100." Hasharon," related Dr. Kaslow in a recent interview. for children to let off steam." take old car tires and paint them to keep everything bright. standard incomes. The mothers are emotionally depleted. We must help give Israeli children a good start." sume parenting as well as teaching functions. all partners in the task." 1843 by 12 emigres in New York City..
fighting religious and racial bigotry. guiding hand of B'nai B'rith. Jewish community and to this nation. Franklin Delano Roosevelt and Harry S.
Truman to Dwight Eisenhower and John F.
your cause has given faith to your nation. You are pro-justice and pro-freedom." higher praise than this can there be? place who killed 230 Marines in Lebanon? Middle East either, for that matter. Edrtor and Pubf.sKer Executive Editor Hlw. seemed right not to help,"
things are done in Russia. go to the U.S. directly. was afraid to go ic classes. this area. I love it here." 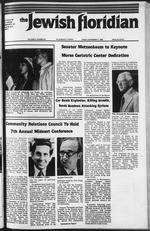 I he Jewish Listener's Digest, a radio magazine. JEWISH MUSIC AND CULTURE HOUR Sunday. Nov. 13, 10 p.m.-WHRS-FM Stereo 91-with host Dr.
culture and lifestyle in Romania. through a feed back process. TV **ortal Ch.p.1. iM./FaMnl Director. Spo~ori Tk. GUAJID1AN PLAN, hm^ TmmmSTwSL. perience and on its constancy. for Ned Goldberg or Eugene Topperman. .
stitutions. Contact Rabbi Alan Sherman, Chaplain. Jewish homes for years Tetley knows that |ust as '"**.
. 10 a.m. American Jewish Committee board noon. iomen Chai 7:30 p.m. Temple Israel baord 8 p.m.
Development-Young Adult Division Cabinet 8 p.m.
Federation General Assembly through Nov. 20 at Atlanta. )rah -1 p.m. Hadassah Shalom 1 p.m.
Joon Women's American ORT Haverhill 11:30 a.m.
federation CJF General Assembly at Atlanta. *wii daily indudtd i^UI 8.
communal life were on the top of the agenda. Three unrelated Greenbaums, [left to right] T^.w u f ^T* *"
Open Board Medina to ri*h|l K,ren L,st Sharl Fuss ,nd Dr- Lind"
and sugar; hmt in eggs andvanilla. Cut with holiday cookie cutters. Place on ungrtased making sheets. cages. Decorate or tear* plain. festive holiday baked goods and side dishes. The cedar is the national symbol of Lebanon. ing the overall money supply. esteem of his countrymen and the respect of all nations. Fund, the agency which is coordinating this effort. speaker will be Bern ice S.
North "A" St., Lake Worth. our auditorium on Nov. 20.
tha O^rlah Fadaratlon of Palm Bach County. reviewer I rank A. Bostwick. program will start at 10 a.m.
day, Nov. 15 at 7:30 p.m.
A Decorator for the day? Entry to D. & D. Showrooms? Rabbi Joseph Kelman, gue's Metropolitan Region. project was originated by Dr.
st Palm Beach at 8 p.m. I who select the winners. final banquet will be Morris B.
the Society, please contact Dr.
A ttMiFICIARV MMI Of THl JtWlSM FEOCMAIKWt Of MIM MACM COUNT! of the music scene in the nation. Symphony: MA THIS DER MAHLER. 6 PM weekdays. Phone 6834012.
and the Fine Arts Council. between 9 a.m. and 12 p.m.
that have been our practice for over 33 years. 10 Causes U.S. Israel Chasm? force poses to Israel s security. fa in New York City. We Will Mount It For You Free of Charg*! Should Prince Ask Jews for Funds? Nov. 4, at Temple Beth Zion. gift from the British taxpayer. tributed a small sum to I"
peal itself, and the terms! a.m., 7 p.m.. Mine ha followed by Sholosh Suedos. 4657 Hood Road, Palm Beach Gordens 33410. Phone 694-2350. Friday 8 p.m., Saturday 10 a.m.
Thursday 8:1 5 o.m. Friday 8:15 p.m.. Saturday 9 a.m.
Cantor Chaim Bolluck. Phone 793-9122. Stuort, FL 33490. President Lief Grozi: 1-287-7732. Friday! Boco Raton 33432. Phone: 368-1608, 391-1 111. Robb.Berc"
Rosayn. Sabbath services, Fridoy 8:15 p.m.
at St. Jude Church (Parrish Hall) 204 US No. I So.;*! address Plaza 222. U.S. No. 1, Tequesto 33458. phn9'". a.m. Sabbath morning services 10:30 o.m. 190 North County Road, Polm Beach 33480. Phone 832-0804. Friday 8:30 p.m., Saturday 9 a.m.
services, 5 p.m. and 8 p.m., Saturday and holiday, 8:45 o.m. Daily Minyan, 8:45o.m. and 5 p.m.
p.m. in Senter Hall, 281S N.
ices, which are held at St.
ton, beginning at 8:15 p.m.
Lester L. Levy, at 3466 S. Ocean Blvd., Palm Beach. y, Leon Wilder, and U.S.
wagreed to leave the U.S.
before they depart for Vienna. formalities are over, the U.S.
ing order halted their odyssey. Nov. 13, and Monday, Nov.
the Cultural Center of St.
ern Blvd. and Flagler Dr.